St Kilda is an inner suburb (neighbourhood) of the metropolitan area of Melbourne, Victoria, Australia, 6 km south-east of Melbourne's Central Business District. You'll find plenty of places to visit near St Kilda: Werribee (Werribee Open Range Zoo & Werribee River Park) and RAAF Museum (in Point Cook). 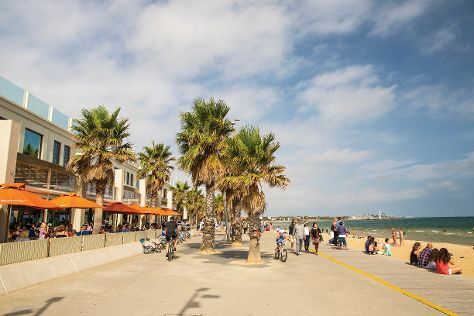 There's lots more to do: kick back and relax at St. Kilda Beach, admire all the interesting features of St Kilda Pier, walk around Albert Park, and get in on the family fun at Luna Park Melbourne. To see maps, traveler tips, other places to visit, and more tourist information, read our St Kilda trip itinerary planner. Kuala Lumpur, Malaysia to St Kilda is an approximately 11.5-hour flight. You can also do a combination of bus and flight. You'll lose 2 hours traveling from Kuala Lumpur to St Kilda due to the time zone difference. Traveling from Kuala Lumpur in September, things will get cooler in St Kilda: highs are around 19°C and lows about 9°C. On the 30th (Mon), wrap the sightseeing up by early afternoon so you can travel back home.